Do you know a professional or qualified staff member who diligently works to demonstrate the following qualities? If so, why not honor these remarkable individuals by nominating them for a 2018 Superior Service Award? The award will be presented to one professional staff member and one classified staff member. Only full-time, benefits-eligible employees with a minimum of one year of consecutive service who have not received the award within the past five years are eligible. A listing of eligible candidates was emailed to campus personnel on Nov. 1. Recipients are nominated by their peers and must reflect each of the five pads of the Lion Paw. 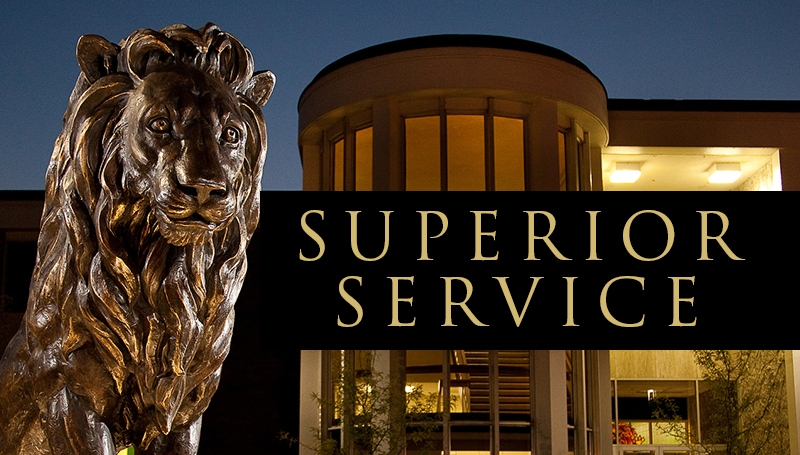 All nominees will be acknowledged at the annual Staff Appreciation and Years of Service Brunch, with the 2018 Superior Service Award recipients also receiving an engraved plaque and $500 cash award made possible by the Missouri Southern Foundation. You may submit your SSA nominee by completing the online 2018 MSSU Superior Service Award Nomination Form. Printed forms are also available in the Human Resources office (Hearnes Hall, Room 217). Deadline to submit nominees is Friday, Nov. 30. For more information, contact Human Resources at HR@mssu.edu.